The Hoo peninsula in North Kent is not unfamiliar with threats to its most excellent natural environment. Leading the litany of potential destruction have been a variety of over-blown airport proposals. Not far behind was the proposal to develop the carbon-spewing Kingsnorth power station. The area is very special to us here at the RSPB – one of our oldest nature reserves, Northward Hill, is at the heart of the peninsula and Cliffe Pools is a great place to get to know the wildlife of the Thames estuary. Some of the wildlife and natural environment of Hoo is of international renown – places that number amongst the best in the world for which the UK has an international responsibility to safeguard. Less celebrated is a wood that is set to become a new name that becomes familiar to readers of these posts – Chattenden Wood is a Site of Special Scientific Interest (so part of our network of nationally important wildlife sites) – the ‘special’ comes particularly from its population of woodland birds. 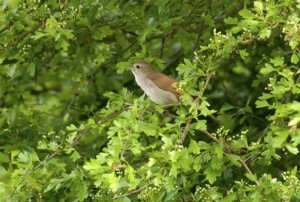 In spring the woods, and increasingly the developing scrub nearby, resonates to the nocturnal carolling of nightingales. Not just one or two, but dozens. Now, nightingales are in trouble – their numbers have crashed during my lifetime. Where there were ten in the mid 60s – now there is only one. In the last decade their numbers have halved. Kent (where I grew up and where I got to know nightingales) is still a stronghold for them – over a quarter of the English (and thus UK) population. So, nightingales put the special in this SSSI – it makes it one of the most important sites we have for them, and their liquid song has spread to the scrubby areas outside the designated site. I’ve a horrible feeling that you know there is more to come! And it’s true – a proposal for 5000 houses plus associated development, known as Lodge Hill, could damage some 35ha of the SSSI as well as destroy extensive areas of scrubby woodland that is summer home not only to nightingales but also turtle doves and cuckoos, birds that are also in serious decline. We know Medway Borough Council is committed to protecting the natural environment and we work closely with them on many nature conservation issues – we are confident that they will listen carefully to our concerns. Time is short for responding to this planning application, the RSPB will be objecting to the proposal in its current form and we would urge you to step up and add your voice.